Look for shortness of breath. The tumor can press against the windpipe (trachea) causing difficulty getting air into your lungs. 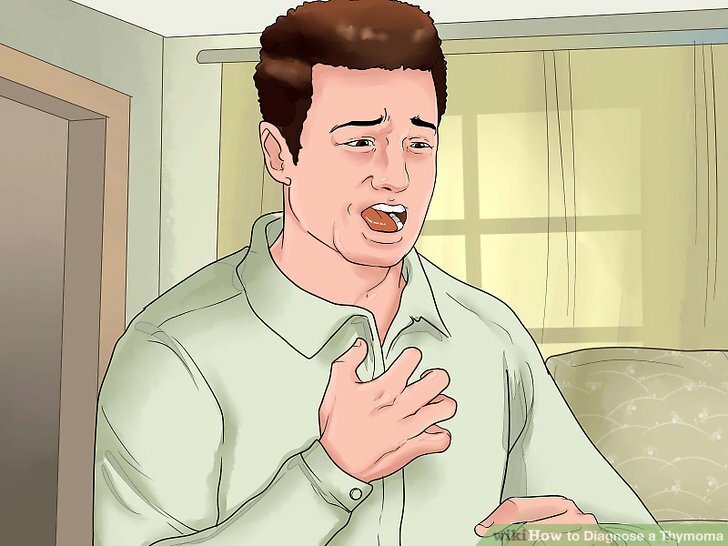 Note if you easily become out of breath or feel like something is stuck in your throat to cause a choking feeling. 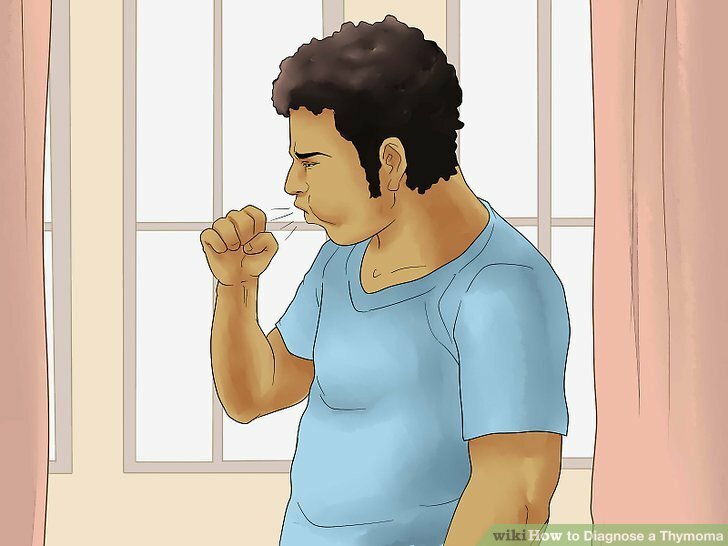 If shortness of breath happens after exercise activities note if you have a wheezing (high-pitched whistling sound) noise when breathing. This can be asthma. The tumor can irritate your lungs, trachea (windpipe), and the nerves associated with your cough reflex. Note if you have had a chronic cough from months to years with no relief from suppressants, steroids, and antibiotics. If you have acid reflux from spicy, fatty, or acidic foods, it can lead to a chronic cough. If altering your diet reduces the cough, then it isn’t likely a thymoma. If you live in or have traveled to an area with tuberculosis (TB) and have experienced a chronic cough, bloody sputum (blood mucus coughed up), night sweats, and a fever, then you may have TB for which you should still see a doctor immediately. Note instances of chest pain. 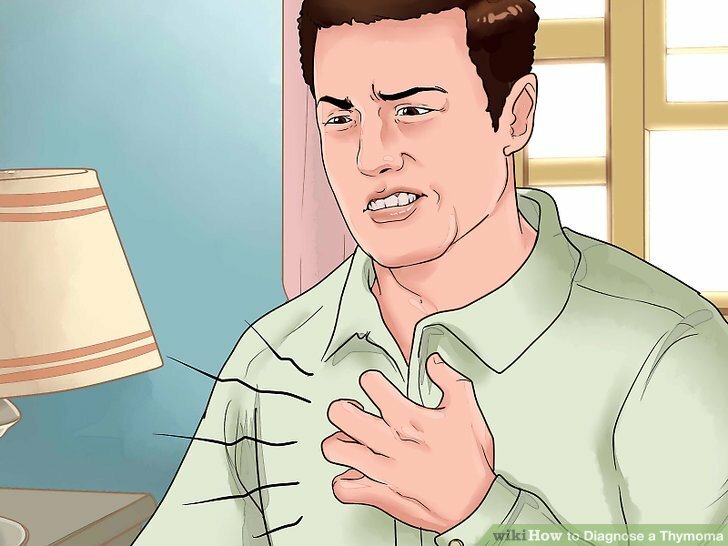 Due to the tumor pushing on the chest wall and heart, you may develop chest pain characterized by a pressure-like feeling and location only in the center of your chest. Also, you can develop pain behind the breastbone that may hurt when applying pressure to the area. 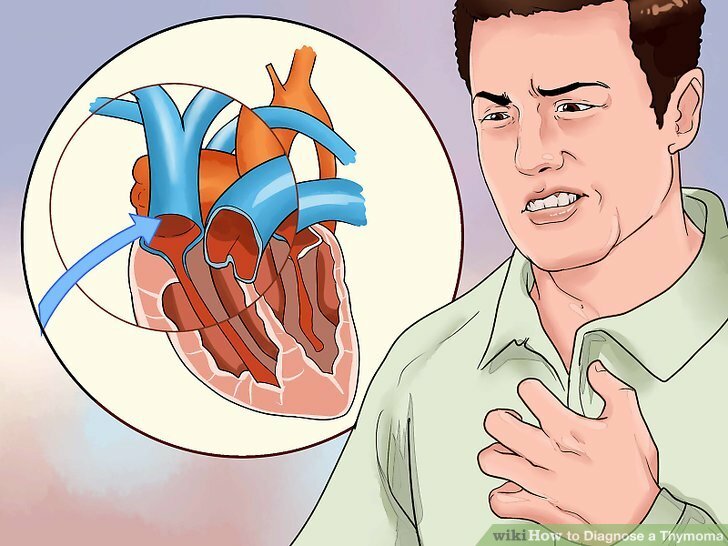 If you feel pressure-like chest pain and have sweating, palpitations (feel like your heart is jumping out of your chest), fever, or chest pain when moving or breathing, then you may have an underlying lung or heart disease. Regardless of the root cause, you should see a doctor for these symptoms. The thymus can grow and push against the esophagus, causing difficulty swallowing. Note if you have trouble swallowing meals or you recently switched to a more liquid diet because it’s easier. The trouble may also feel like a choking sensation. 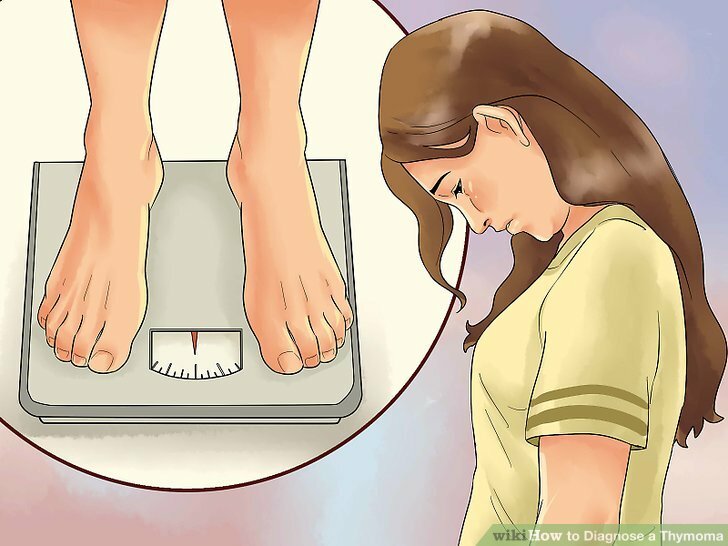 Because the thymus tumor can become cancerous and spread throughout the body (very rarely), you may experience weight loss due to the increased needs of the cancer tissue. Check your current weight against an older reading. If you experience unintentional weight loss without any known reason, check with your healthcare provider. Many cancers have weight loss as a symptom. Examine for superior vena cava syndrome. 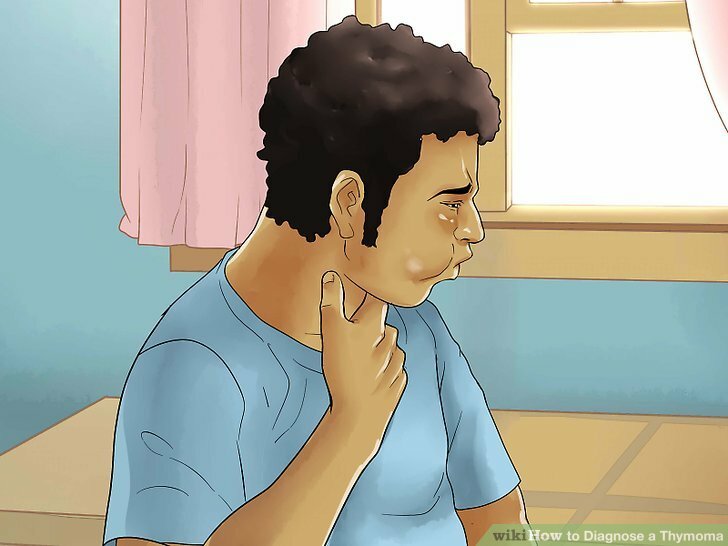 Swelling of the face, neck, and upper body. Note if the upper part of your body looks more red or flushed. Dilated veins in the upper body. Look at the veins in your arms, hands, and wrist to see if they look more prominent or dilated. These are usually the dark lines or tunnels we see on the hands and arms. Headaches due to dilated veins supplying the brain. Dizziness/light headedness. Because blood is backed up, the heart and brain receive less oxygenated blood. When your heart pumps less blood to the brain or when your brain doesn’t receive enough oxygenated blood, you feel light headed or dizzy and may fall. Laying down helps remove the force of gravity your blood has to fight to supply your brain. 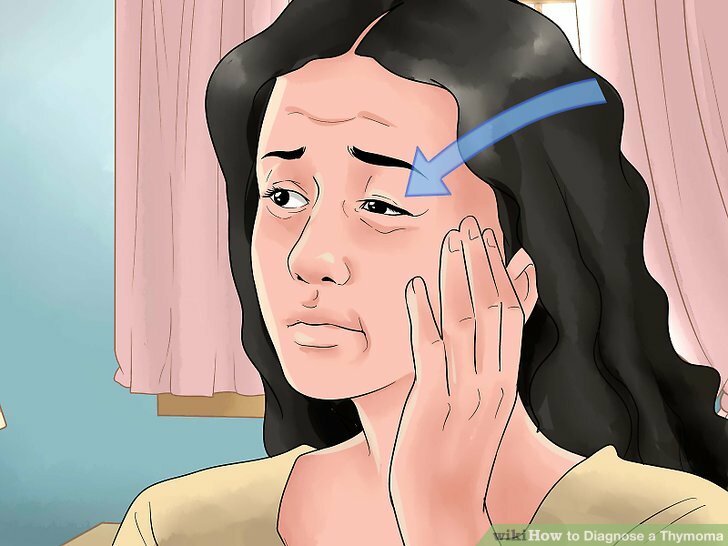 Note symptoms consistent with myasthenia gravis (MG). 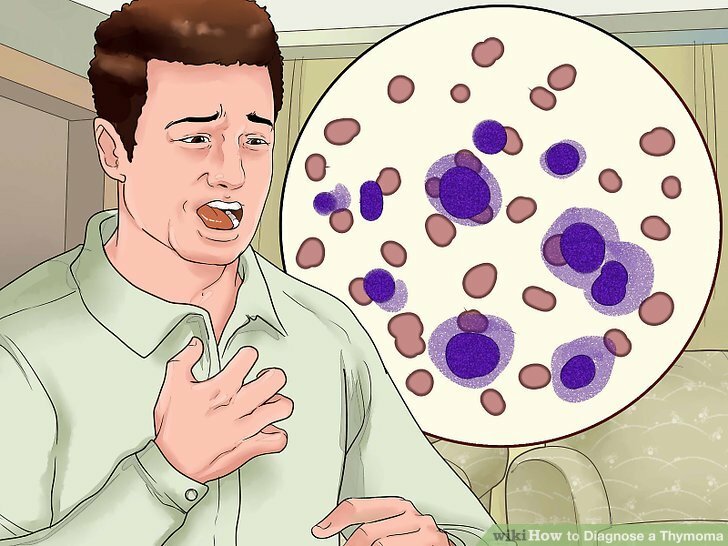 Look for symptoms of red blood cell aplasia. 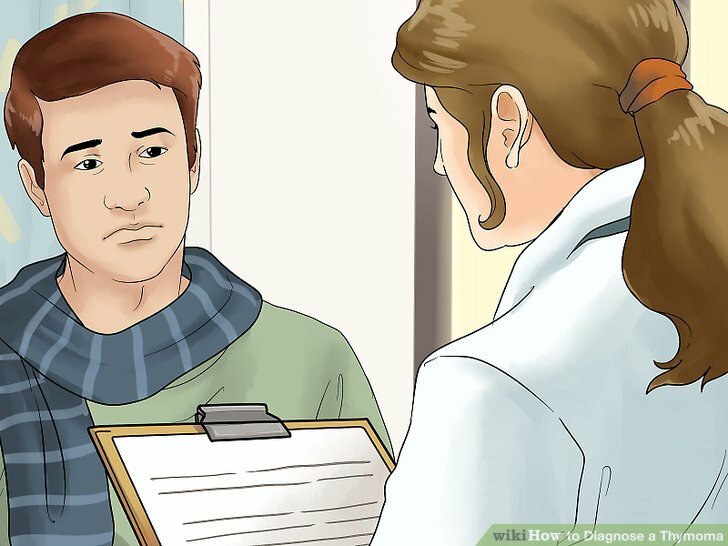 Examine for symptoms of hypogammaglobulinemia. 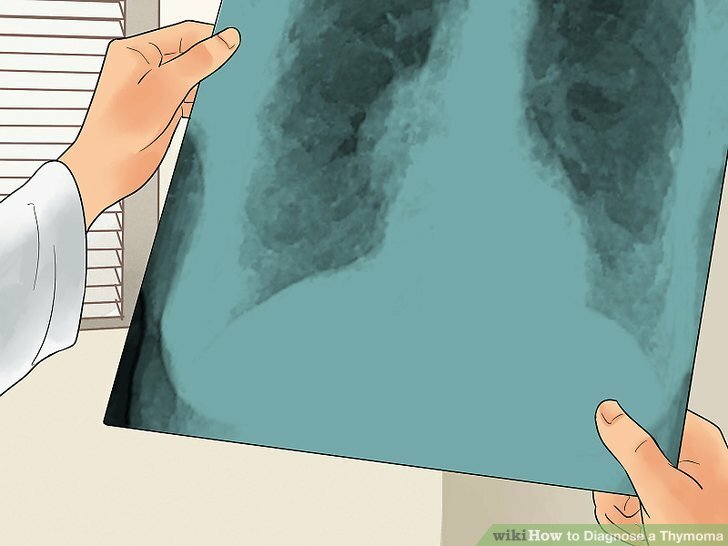 Bronchiectasis, which includes symptoms such as a chronic cough, large amounts of spit that may contain foul-smelling mucus, shortness of breath and wheezing, chest pain, and clubbing (the flesh under your fingernails and toenails gets thicker). Mucocutaneous candidiasis, which is a fungal infection that can cause thrush (an oral infection causing white patches or milk curd-looking growths on the tongue). 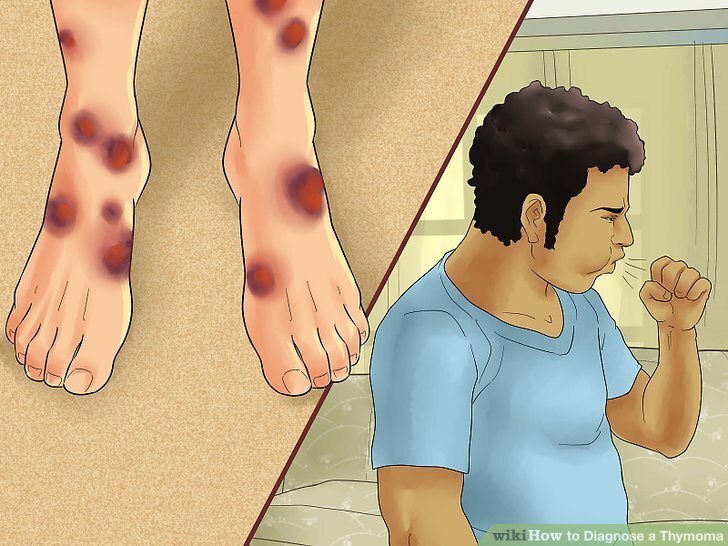 Viral infections, including the herpes simplex virus, cytomegalovirus, varicella zoster (shingles), and human herpes 8 (kaposi’s sarcoma), which is an underlying skin cancer usually associated with AIDS. Your doctor will collect a detailed medical history, including family history and symptoms. He or she will also ask questions based on thymoma symptoms, including those related to myasthenia gravis, red cell aplasia, and hypogammaglobulinemia symptoms. Your doctor may feel for fullness in the middle lower neck for overgrowth of the thymus. 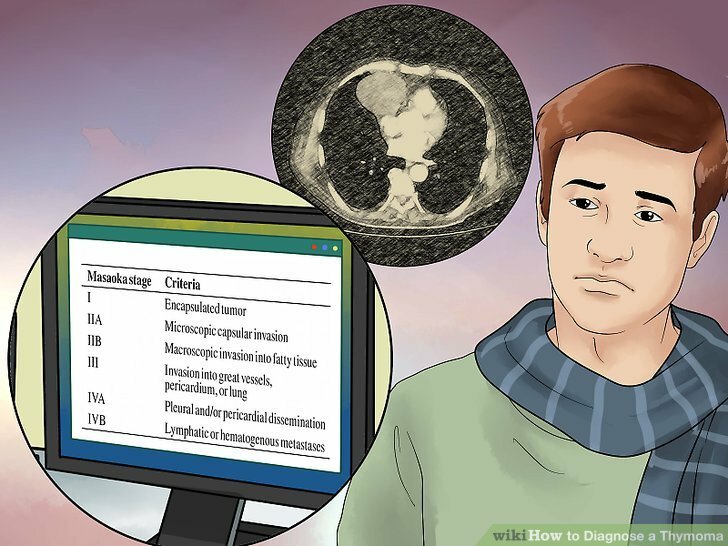 There are no lab tests for thymoma diagnosis, but there is a blood test to detect myasthenia gravis (MG) called anti-Cholinesterase AB. MG is so common in those with thymomas that it is considered a solid indicator before more expensive testing. About 84% of people under 40 with a positive anti-Cholinesterase AB test have thymomas. Before operating to remove the thymoma, your doctor will also treat the MG because if left untreated, it can cause problems with anesthesia during surgery, such as respiratory failure. To visualize a tumor mass, your physician will first order an x-ray of the chest. The radiologist will look for a mass or shadow near the center of the chest on the lower neck. Some thymomas are small and will not show up on the x-ray. If your doctor is still suspicious or if an abnormality appears on the chest x-ray, he or she may order a CT scan. A CT scan will take multiple, detailed images in cross sections from the lower part to the upper part of your chest. You may be given a contrast dye to outline the structures and blood vessels in your body. The images will give a more detailed understanding of any abnormalities, including the staging of the thymoma or if it has spread. If contrast was given, you may be advised to drink plenty of fluids to flush it out. An MRI will use radio waves and magnets to produce a series of very detailed images of your chest on a computer screen. A contrast material called gadolinium is often injected into a vein before the scan to better see details. MRI of the chest may be done to look more closely at the thymoma or when you can’t tolerate or are allergic to the CT contrast. MRI images are also particularly useful in looking for cancer that may have spread to the brain or spinal cord. 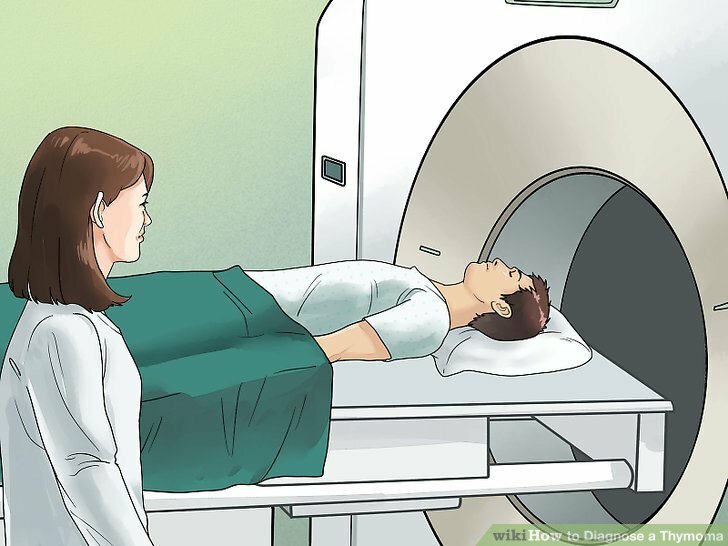 MRIs are very loud and some are closed meaning that you will be inserted lying down in a large cylindrical space. This can give the sensation of claustrophobia (fear of enclosed spaces) to some people. The test may take up to an hour to complete. If you were given contrast, you may be advised to drink plenty of fluids to flush it out. Submit to a PET scan. This is a scan that uses a radioactive atom in glucose (type of sugar) that attracts to the thymoma. The cancer cells take up the radioactive substance and a special camera is used to create a picture of areas of radioactivity in the body. The picture is not finely detailed like a CT or MRI scan, but it can provide helpful information about your whole body. 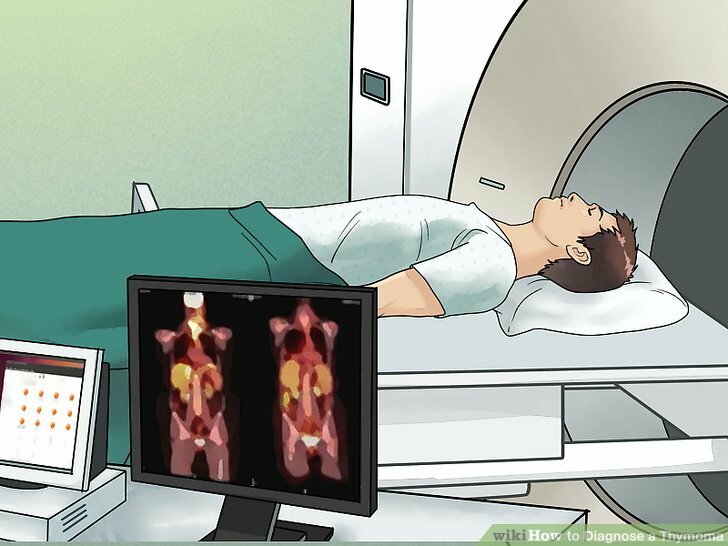 This test can help determine if a tumor seen on an image is actually a tumor or not or if the cancer has spread to other parts of the body. Doctors use combined PET/CT scans more often than PET scans alone when looking at thymomas. This lets the doctor compare areas of higher radioactivity on the PET scan with the more detailed images on the CT scan. You will be given either an oral preparation or injection of the radioactive glucose. You will wait thirty to sixty minutes for your body to absorb the material. You’ll need to drink plenty of fluids after to help flush the tracer from your body. The scan will take approximately thirty minutes. 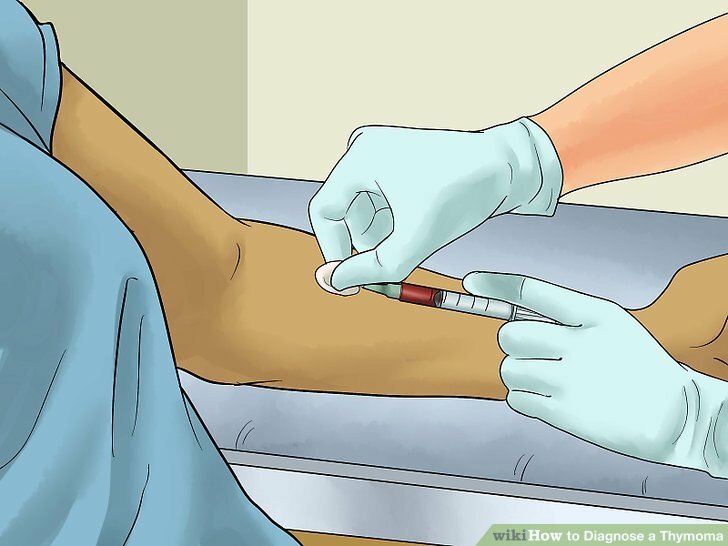 Allow your doctor to perform a fine needle biopsy. 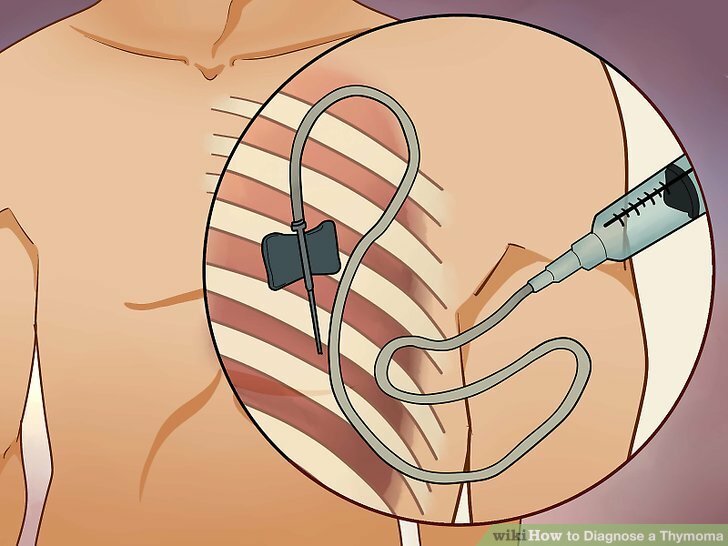 Using a CT scan or ultrasound machine for visual guidance, your doctor will insert a long, hollow needle into your chest and into the suspected tumor. He or she will remove a small sample of the tumor to examine it under a microscope. If you are taking blood thinners (coumadin/warfarin), your doctor may ask you to stop days before the exam and not to eat or drink the day of the procedure. If they decide to use general anesthesia or IV sedation, you may be asked to fast the day before the procedure as well. 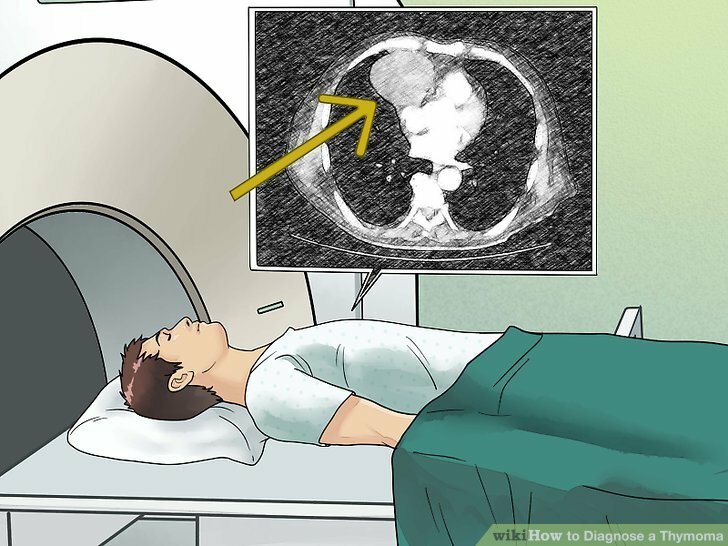 A possible downside of this test is that it might not always get enough of a sample to make an accurate diagnosis or allow the doctor to get a good sense of the extent of the tumor. Have the tumor biopsied after surgery. 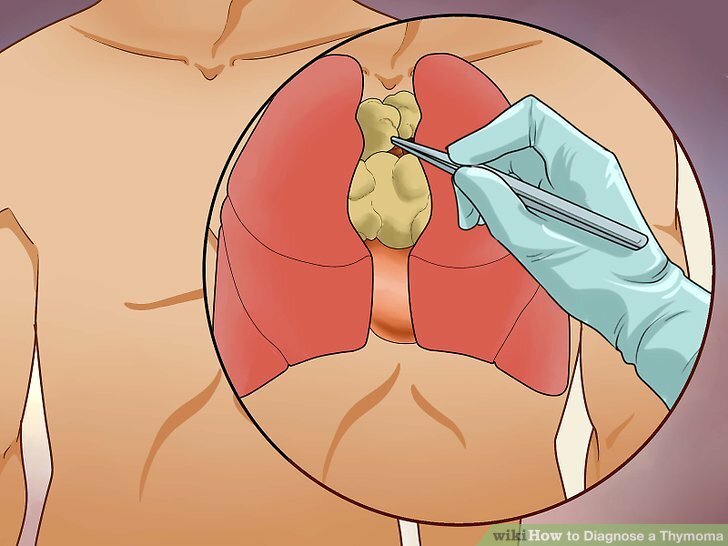 Sometimes your doctor may do a surgery biopsy (remove the tumor) without a needle biopsy if the evidence of thymoma is strong (lab tests and imaging tests). Other times a doctor will need to perform a needle biopsy first to confirm it is a thymoma. The specimen is sent to the lab after surgery to confirm the diagnosis. The exam preparation (fasting, etc.) is similar to that of a needle biopsy, except an incision will be made in the skin to gain access to the tumor to remove it. Have the thymoma staged and treated. The stage of the tumor refers to the extent of spread to other organs, tissues and distant sites of the body. Therefore, having the thymoma staged is an essential part of determining the best course of treatment. The most commonly used staging method for thymomas is the Masaoka staging system. Stage II is a thymoma with a macroscopic invasion of the mediastinal fat or pleura or the microscopic invasion of the capsule. Treatment is usually a complete excision with or without postoperative radiation therapy in order to reduce the incidence of recurrence. Stage III is when the tumor has invaded the lungs, great vessels, and the pericardium. Complete surgical excision is necessary together with postoperative radiation therapy so that recurrence will not occur. Stage IVA and IV B In these final stages, there is pleural or metastatic spread. The treatment is a combination of surgical debulking, radiation, and chemotherapy.